Karen's Garden Cottage: Come Play in the Sand...A Tutorial on Making Sand Candles! 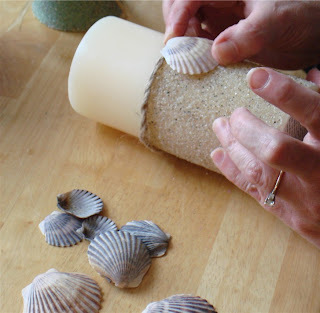 Come Play in the Sand...A Tutorial on Making Sand Candles! It's a beautiful day on Cape Cod. Since it's spring break for many schools, people are here! (As a matter of fact, we have family visiting.) It seems as though the dull gray curtain of winter is going up, there's a full cast of players, and the director, Mother Nature has yelled: "Action"! 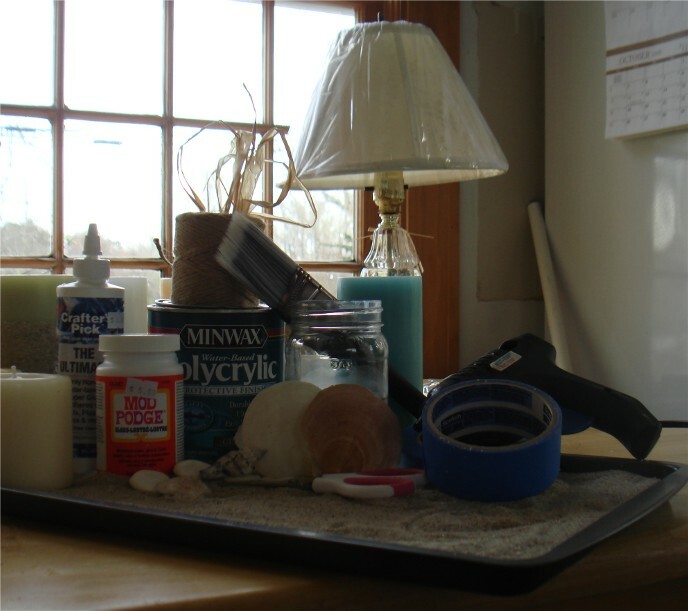 And what is Cape Cod to those who only come during the warmer, sunnier months? For many, "SAND" and "SEA" head up the items on the list! 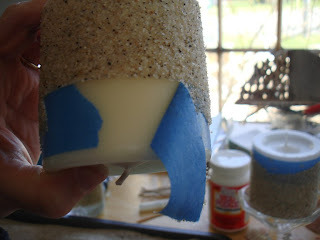 In celebration, I bring you my tutorial on creating SAND CANDLES! 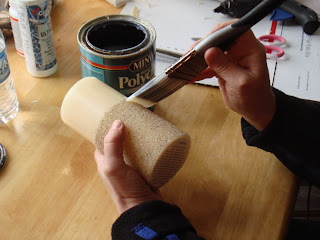 I hope you enjoy the craft and my step-by-step, (hopefully easy) instructions. So, follow me and "Come Play in the Sand"! clear drying craft glue, such as, Crafter's Pick, Mod Podge, or other glue of choice, so long as it sticks to plastic, metal, glass etc. 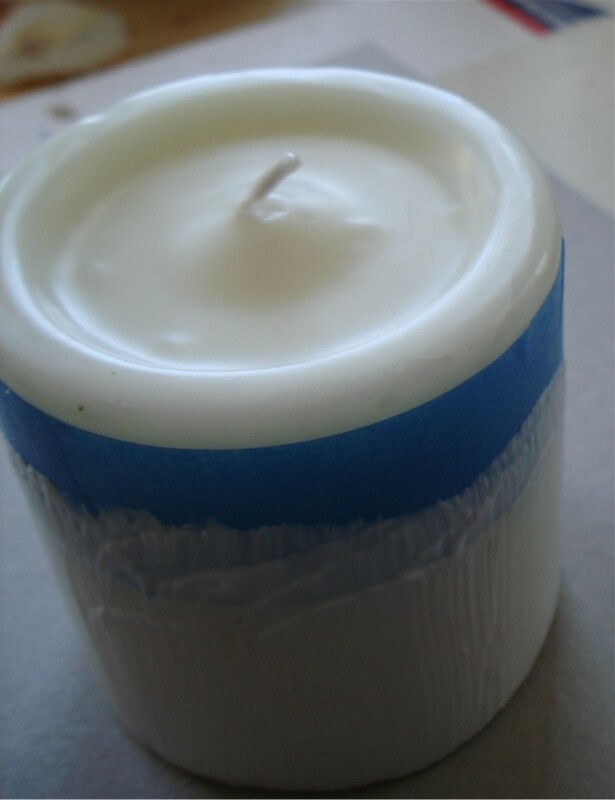 Wipe your candle clean and evenly tape off the top of the candle. 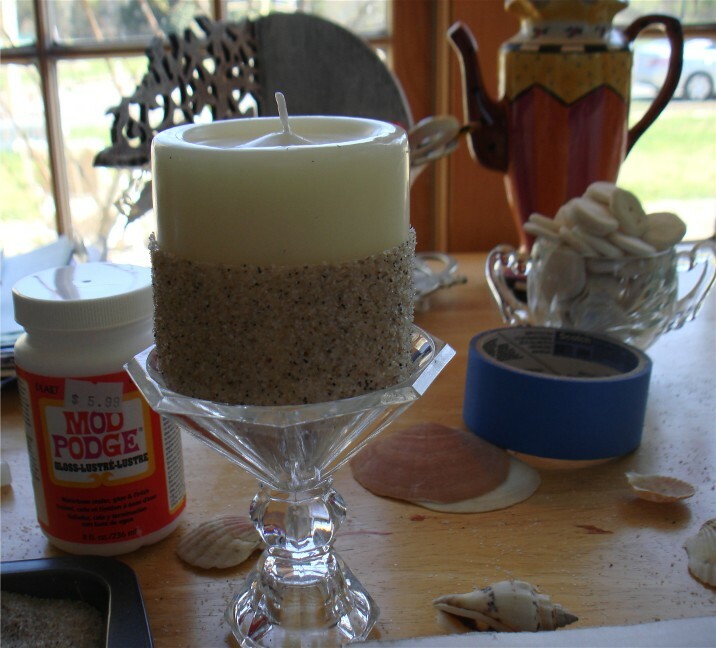 (Part you want exposed)...We don't want sand, glue, or sealer too near the top and flame! 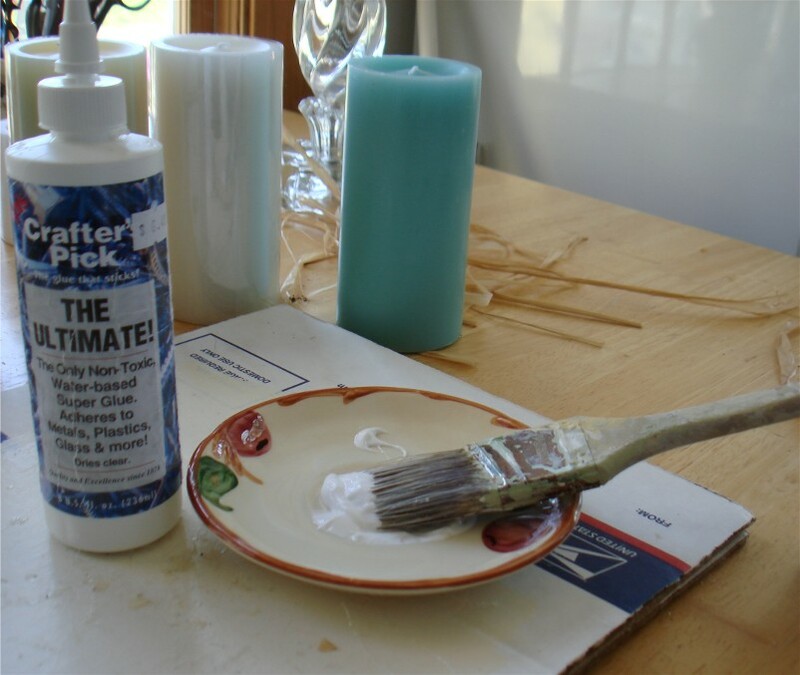 Put some glue into a dish and load your brush. Paint a nice, thick, even coat of glue onto the candle. Notice the thick, even coverage. If your glue coverage is spacey, like this, or beads up and drips off, you are either not using the right glue, you have not properly loaded your brush, or you have watered your product down. PS: Do not use spray adhesives! Press and roll your glue coated candle in the sand. Repeat!...Get a nice heavy coat of sand on your candle. Let it set for about 5 - 10 minutes. It will be tacky and set, but not thoroughly dry. 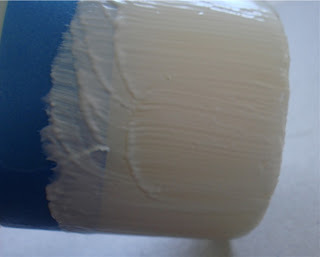 If it becomes too dry, it is hard to pull the tape and get a crisp line. 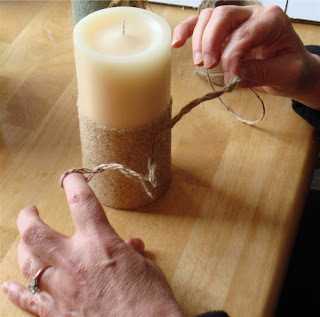 Carefully, pick up the candle and hold upside down. Carefully, pull the tape off, with a downward and on the diagonal, motion. 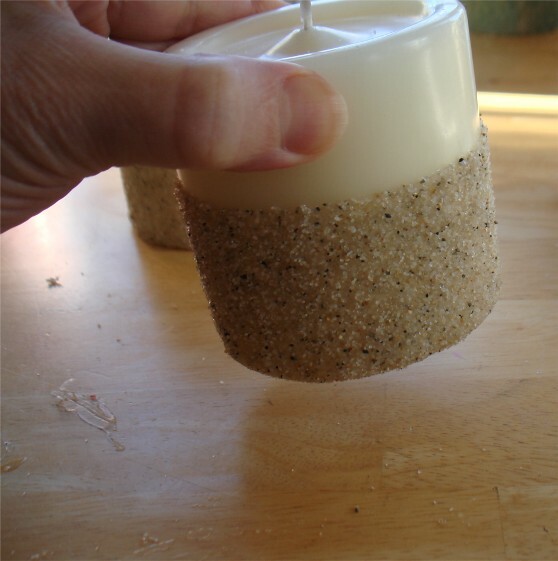 Now your candle needs to set and dry for at least 1 - 2 hours. So, here is your candle with the sand glued onto its base, all set and dried. It is now ready to be sealed. Give it a gentle little tap for luck and loose sand. Here we have the Polycrylic, nylon brush, and prepared candle. 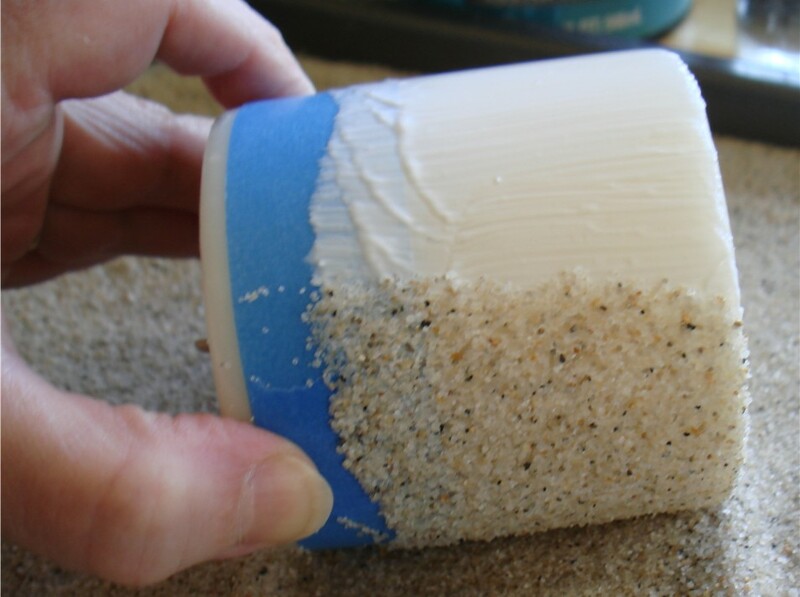 Gently, "dab-paint" the sealer onto the dried sand. Once coated, you can take your brush and go around the candle, gently wiping off the excess. 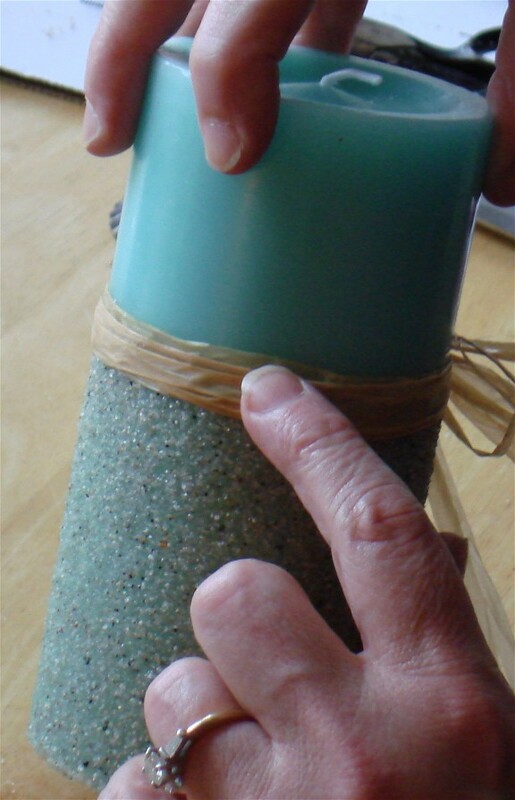 Place your sealed, still wet candle down on wax paper. 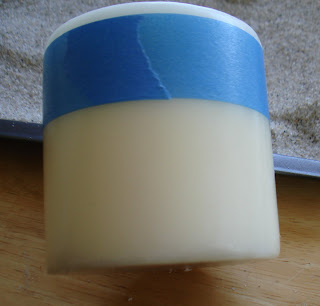 I like to let it set about an hour, pick the candle up, gently wipe excess off the bottom of the candle (being careful not to pull off any of the bottom rim of sand) and place it back down on a clean piece of wax paper to completely dry, for several hours or overnight. 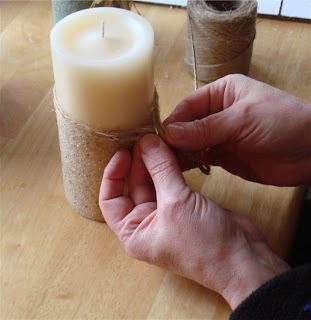 On this dried and sealed candle, I have chosen the 3-ply jute for my rim-of-sand decoration. Here, I am measuring a doubled strand, before cutting. 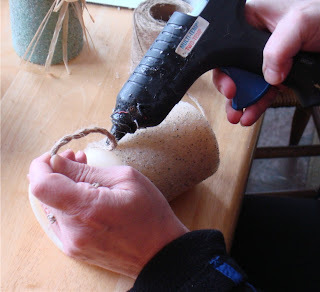 While my glue gun heats up, with the loop on one side, and the ends of the doubled strand on the other, I twirl it into a rope! Starting with the cut ends, carefully glue your jute roping down and around the rim-of-sand, ending with, and slightly overlapping, the loop onto the starting point. Pick your shell and coat the underside with the hot glue, (please don't burn your fingers) making sure the parts of the shell that touch the rope and candle have enough glue to secure the shell to your lovely sand candle. WONDERFUL! 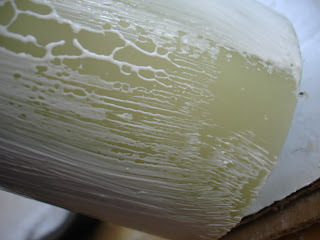 If you've chosen the waxed raffia. 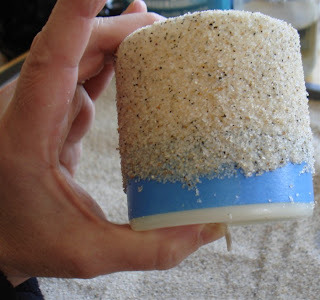 Take a measured piece of a thicker strand of raffia, and carefully/evenly, glue it around the rim-of-sand. Think Mother's Day and Summer! These will be a big hit! Karen your candles are wonderful!! Your tutorial is clear and concise! Thank you for stopping by Dandelion House recently and adding me to your blog roll! Your candles are adorable! I just discovered the battery operated ones too at a Historic Open House we went to over the holidays. They were beautiful lit up and surprisingly bright! Love what you have done with them... and the tutorial is great! Can't wait to get down and see you and your shop in person! Lovely to meet you and your Garden cottage is gorgeous. 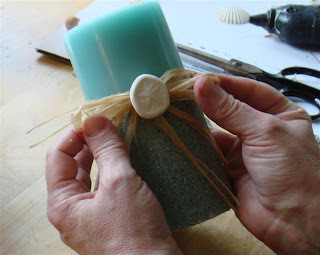 Hey, great tutorial and just in time for Mother's day. Thank you. Wow that is awesome!! Thanks for the tutorial!! This rocks! Adding it to the idea files so everyone can find your great tutorial. Thanks for letting me know about this, I'm going to try it soon! What a great idea you have here! You're going to see a lot of people taking this little recipe into their craft rooms! Karen I love this craft! Really nifty and looks so cute!~ THanks for stopping by, and you have a nice weekend as well! I absolutely love this idea! 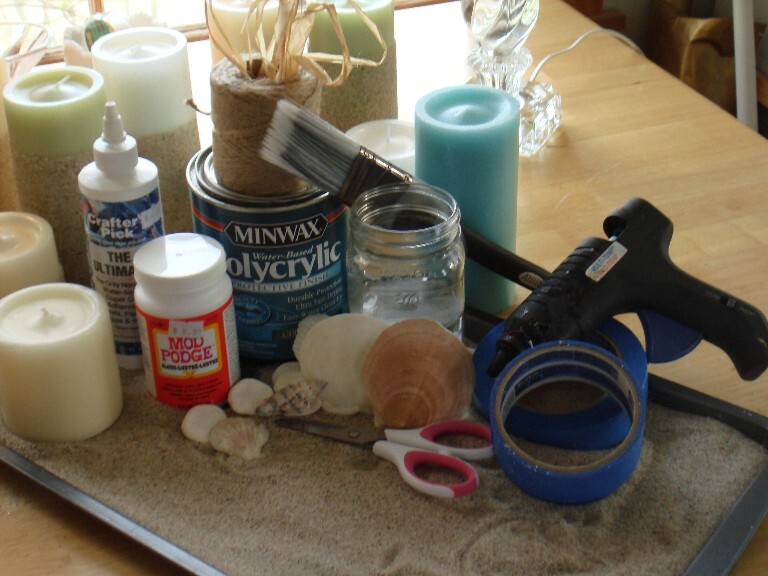 I'm having a beach themed party this summer and this will be perfect! 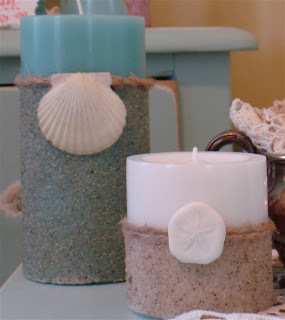 karen, these are beautiful and a great idea for my patio...can't wait to make some! love the new look of your blog. What a great, easy to follow tutorial. 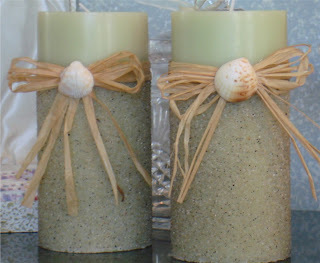 I can't wait to try these sand candles. I just love Cape Cod and am envious of your Cottage. What a dream come true. Just found your blog today and am looking forward to following you. Best wishes to you! Those are so simple and pretty! Thanks for showing us how to make them. What a great gift or a way to bring the beach home. 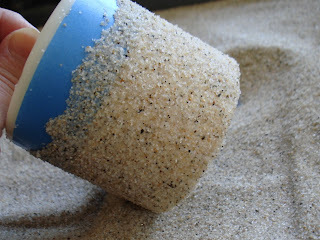 Wouldn;t that be cool to use sand from your favorite vacation spot? Or some collected on a cruise? Anyway, what happens when they burn down? Those are very cute...I'll have to keep those in mind! 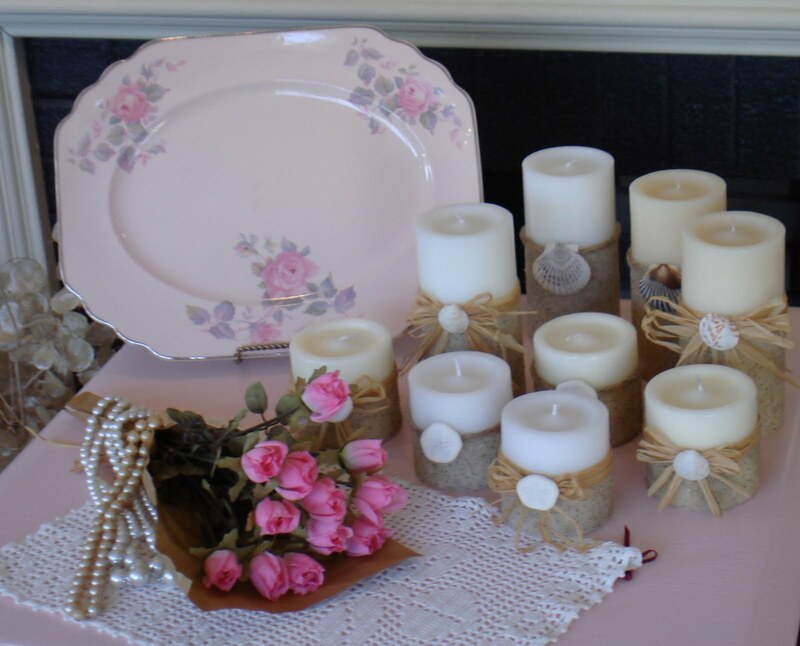 Love the candles and that you used "fake" candles! Thanks for showing us how it's done, there are a couple of steps I would never have known to do. Great job! OHHHH!!!! These are so wonderful!!!!! Thank you for sharing these with us! 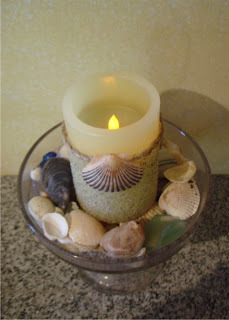 I am going to the ocean in June and I am going to bring some sand back and make some of these!! Awesome! You rock, thank you so much for sharing!! 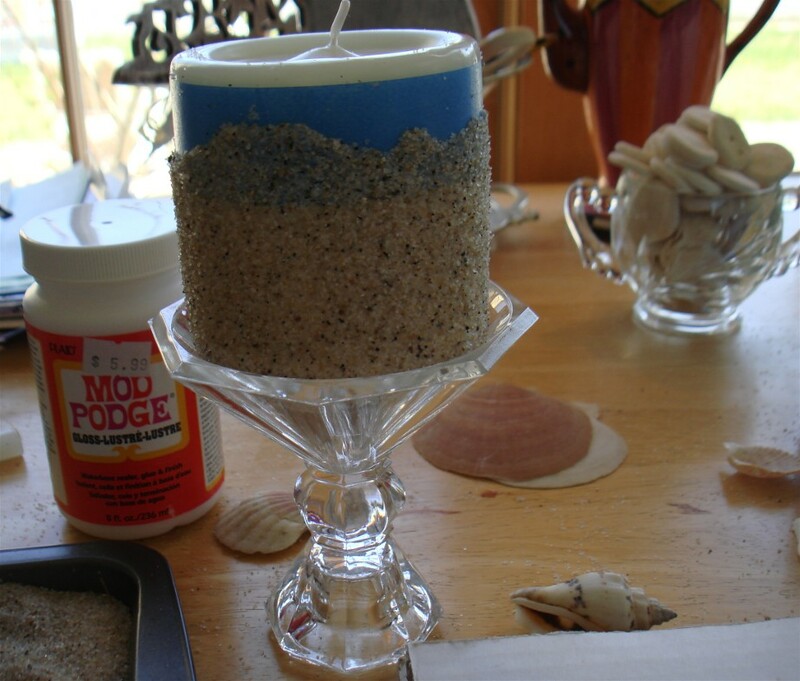 What fabulous sand candles...I'm in love! I'm going to make some for summer dinner parties. Thanks so much! Wow what a fabulous idea! These look amazing! 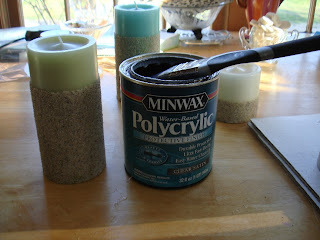 I have so many plain pillars that need a little sprucing up! Would love to have you stop by the Sunday Showcase Party if you get a chance! Thanks so much for the great tutorial! What a great idea. I love how these turned out. I am definitely going to give this a try....just another projected added to the to do list, thanks!!! Beautiful! I just may add these to my product selection! Thanks so much for the tutorial...I'll let you know how they come out! 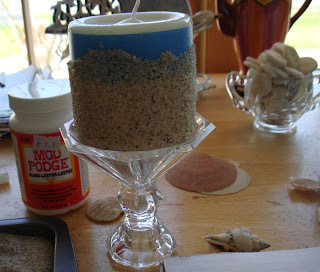 Thanks for sharing great idea of sand candle. I was looking for it.